The first ever Queer Fashion Week exploded this past weekend at four different venues in Oakland, a town that knows how to celebrate queer culture. Miz Chris, of Eden and fiveTEN Oakland Events fame took on this incredible feat, and pulled it off seamlessly. I can’t even begin to describe the excitement and fresh creative enthusiasm that pulsated throughout QFW. The crowd skewed young, ethnically diverse, androgynous and primarily female, but with supermodel Cory Wade of Top Model fame in the house and a sprinkling of hot slightly-older-women and a drag queen or two, the crowd spanned every gender, age, shape and size imaginable. The models and designers delivered incredibly professional presentations, and the vendors, performers, DJs and volunteers knocked themselves out to make this a truly groundbreaking event. From the opening cocktail party to the catwalk, after parties, vendor village and trunk show—QFW was a delightful success! There were also mind-blowing extreme makeup & body art creations, burlesque dancers, top notch celebrity DJs, musical acts, spoken word, hip-hop and rap performances. 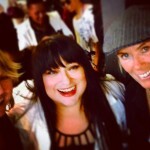 As a media sponsor, the Epochalips crew was on hand to support local queer culture and PARTY! When I was younger, I felt uncomfortable and awkward in girls clothes and chose to wear ill-fitting boys clothes, instead. It wasn’t lost on me how much I would have benefited from an event like this and how very important it is for today’s youth to see and hear about it. At QFW I felt more comfortable in my soft-butch clothes than ever before, and I even bought some FANTASTIC outfits to wear to some upcoming LGBT benefits. NCLR Anniversary Celebration and Our Family Coalitions Night Out anyone? Do you miss me yet, Rain Dove? 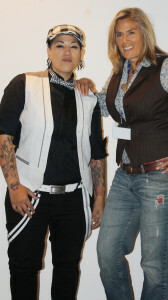 DapperBoi A kickstarter campaign to make androgynous jeans for a womans body. Get involved! Funding opportunities start on April 21st! 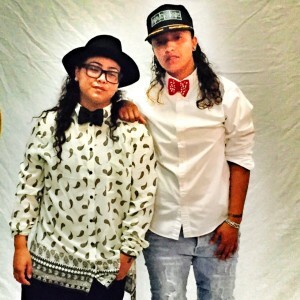 The cast of Oakland based web series Dyke Central modeling clothes was a treat. What is Butch? Movement The first national traveling fashion show movement to showcase dominant lesbians, masculine of center persons, queer, androgynous, and transmen bodied models a place on the runway.